I should have trusted my instincts when I knew NOT to make this recipe. I'm not big on eggs (I can eat them scrambled "hard" or hard-boiled, and that's about it)...anything custard-y or heavy on that eggy flavor is a no go. And sure enough, that's what this recipe turned out to be. On top of that, it was really time consuming. Asparagus is prepped, boiled, and then pureed with onions sauteed in butter, salt, pepper, and a little nutmeg. Eggs are beaten in, and then you stir in a white sauce (which by the way, takes FOREVER to make...bechamel sauces made with nonfat milk are silly). The asparagus tips (which were earlier cut and reserved) are stirred in, and this mixture gets poured into a loaf pan coated with cooking spray and breadcrumbs. THEN, this needs to be baked in a huge bain marie for damn near an hour and a half. Sheesh! So by the time this was FINALLY done, I expected to get a slice of the stuff...but instead, it came out as a strange, mushy, custard-like consistency. After all that baking time, it didn't firm up at all! If this is the texture it's supposed to be, I'll know to never make anything like this again (savory at least, a dessert sformato probably wouldn't be a problem). One small glimmer of hope for this dish was the flavor: basically a light, creamy, sweet asparagus puree...with those overly eggy undertones. But the nutmeg added a nice spice and fragrance, and of course it's the classic pairing with a rich white sauce. 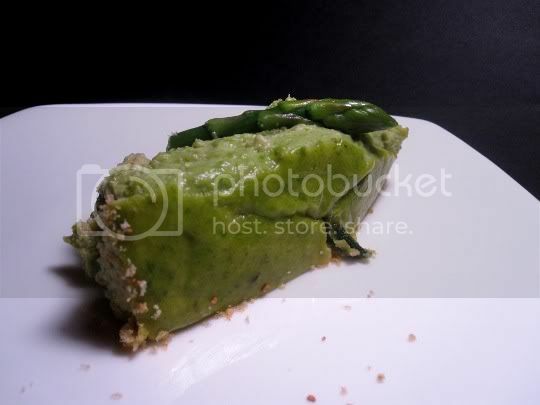 Actually, I think I'd look forward to making an asparagus puree in the future...something I'd never even think of, until this disaster (ahh, there's a silver lining in everything). Make again? Definitely not. I'm sure you can guess where the leftovers of this went. I would have given this a no-heart rating, but it gets one for flavor (and inspiration)! Vegan variation: Don't even bother! But if you insist...pureed tofu can probably be substituted for the eggs, saute the onions in oil, and make a soy-based bechamel. Ehhh, all of that probably isn't even worth it. Yay asparagus puree!